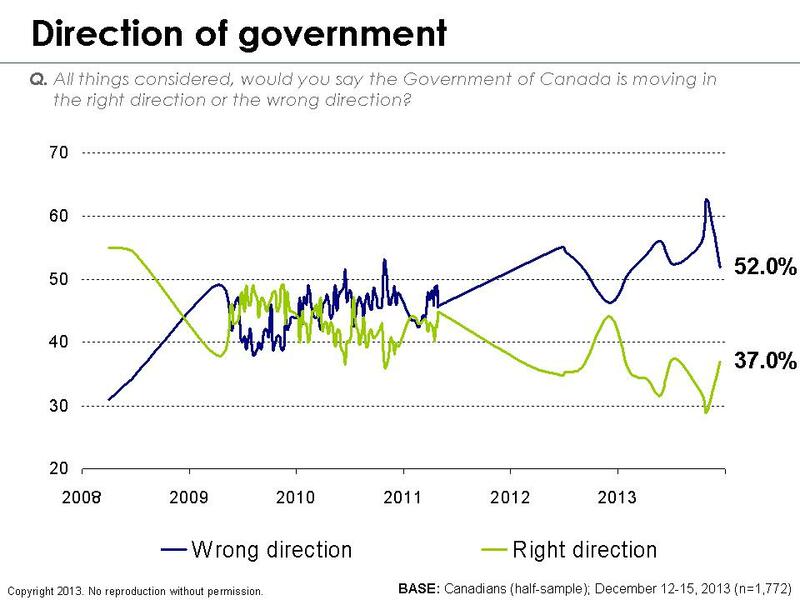 [Ottawa – December 19, 2013] As temperatures plummet, the political landscape appears to have frozen in place, with the Liberals holding a steady six-point lead. 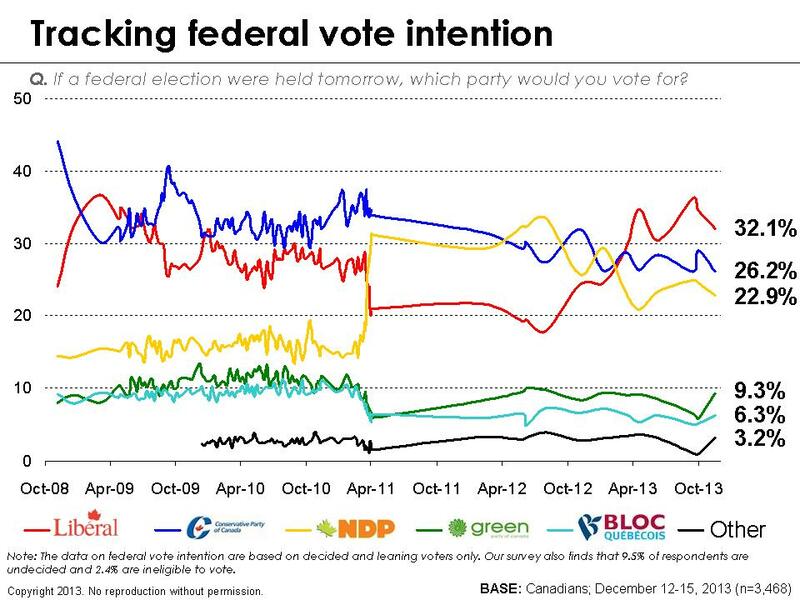 The Conservatives, meanwhile, are closing out an annus horribilis and are mired at a historic low of 26 points. 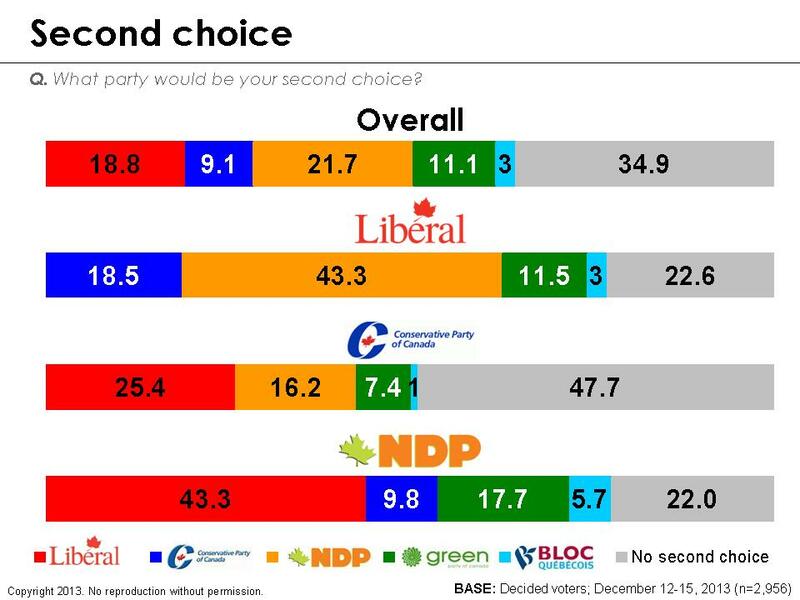 The NDP is in third place at 23 per cent. 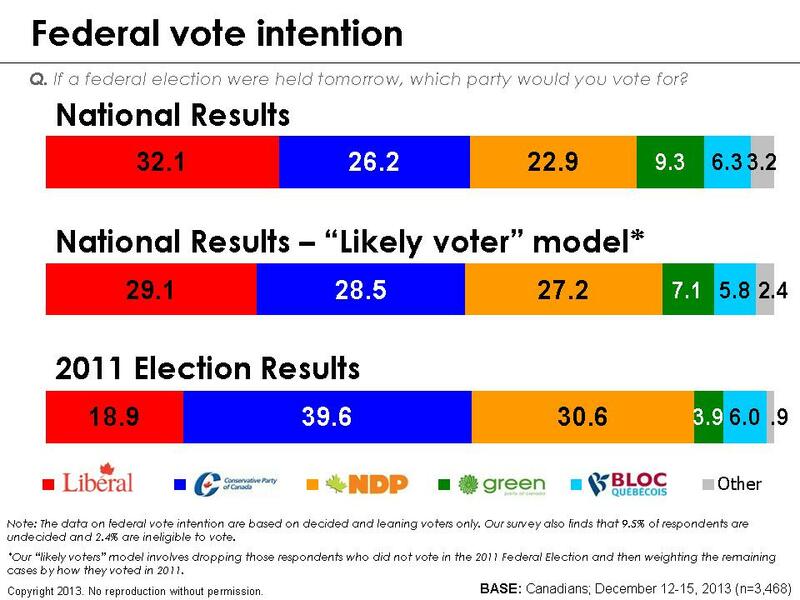 A somewhat resurgent Green Party (having recently doubled their contingent of MPs) is now capturing nearly one in ten voters, which is one of few glimmers of good news for reeling Conservatives, who benefit immensely from vote-splitting on the left side of the political spectrum. The newly leaderless Bloc Québécois is running well above its 2011 disaster, but this vote is almost surely ripe for other parties to capture in next election. Overall, the Liberals are showing good representation across the country, leading in Atlantic Canada, Quebec, and Ontario. The Conservative lead, meanwhile, is widely restricted to Alberta, although they remain highly competitive in the key battleground of Ontario. The NDP has a slight lead in British Columbia, but they are competitive in most areas of the country, notably Ontario and Quebec. The Green Party is doing quite well in British Columbia, although this yielded no real results in the last provincial election. The Conservatives are statistically tied with the Liberals among men, but they are also doing very poorly with women. 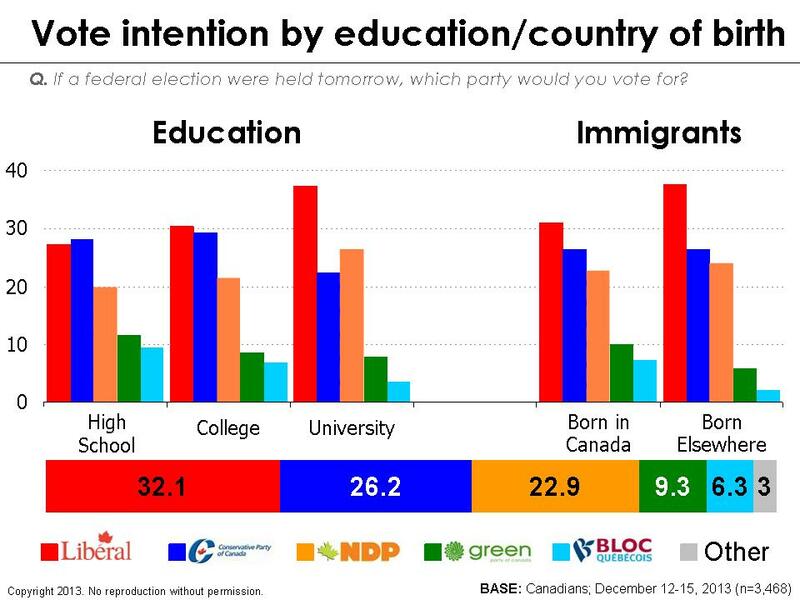 Of much greater concern for next the campaign, however, is the fact the Conservatives now trail the Liberals with boomers and seniors, crucial constituents for future success. 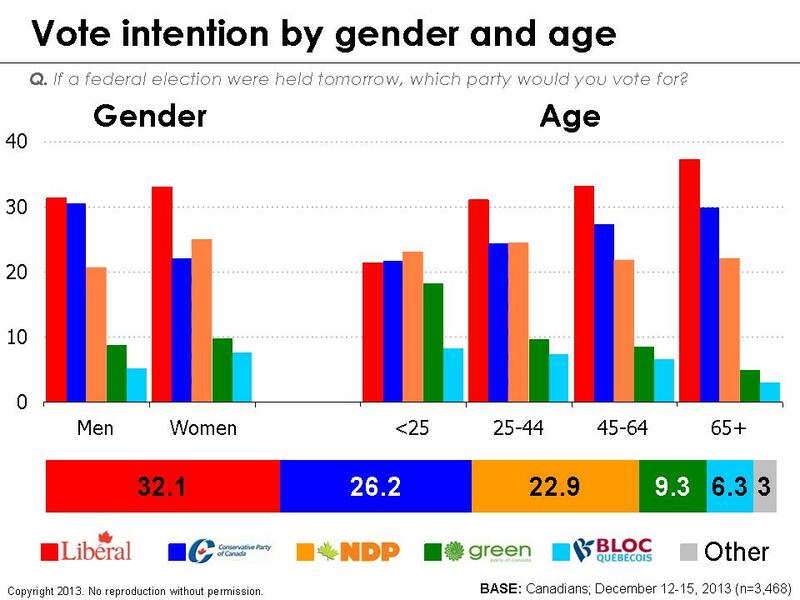 A youthful Justin Trudeau may be the poster child for change and hope, but he is currently lighting it up most strongly with older Canada (a good thing for him since they are much more likely to vote than young voters). 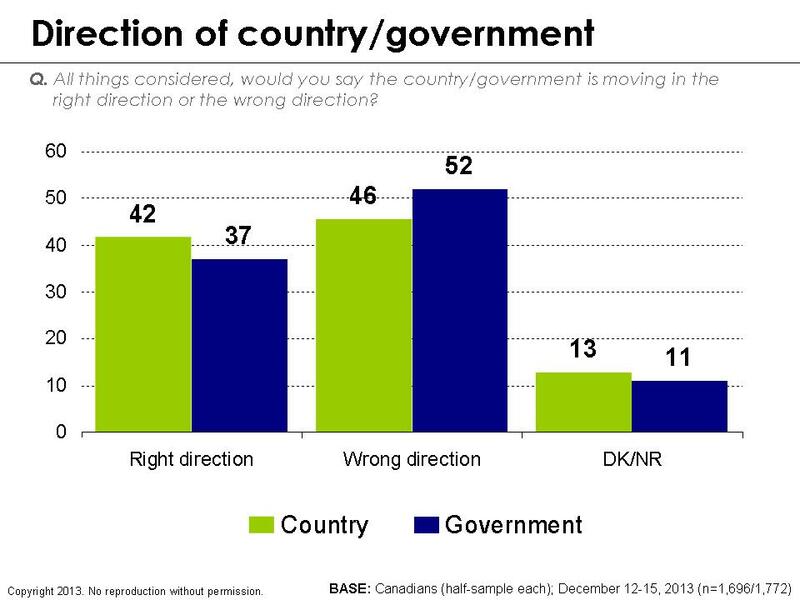 It is also interesting to look at how voters have moved since last election. 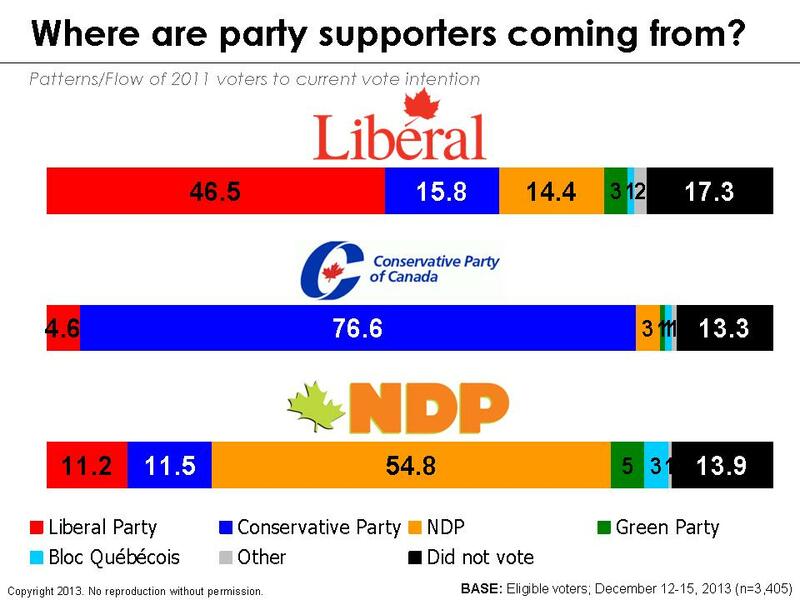 Obviously, the Liberal Party has come out one top as the net beneficiary of voter mobility and they have nearly doubled support from three fairly balanced sources – disaffected Conservatives, NDP voters, and returning discouraged voters. These latter two groups are probably rich in erstwhile Liberal voters from the salad days of the nineties and early 2000s. 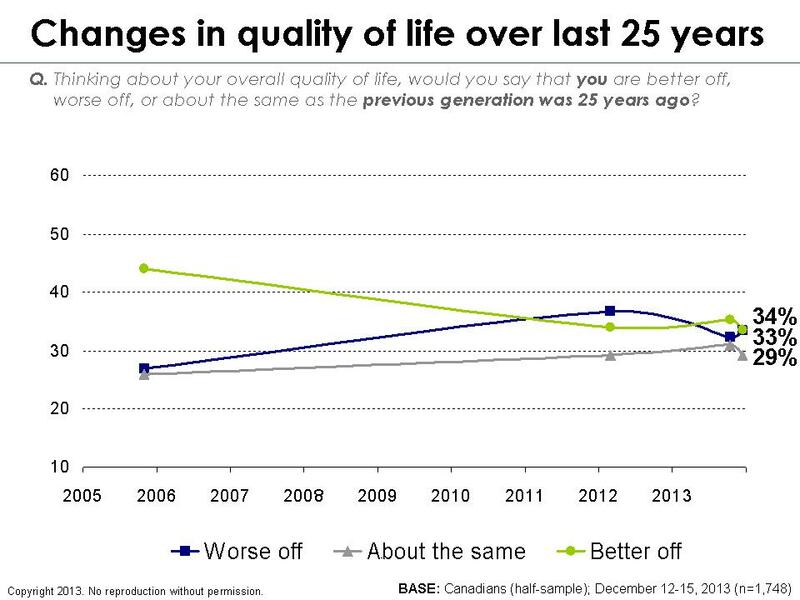 For a very long time, Canadians have been driven by the resolute belief in progress and a better future. This belief, however, has been unravelling itself over the last several years. 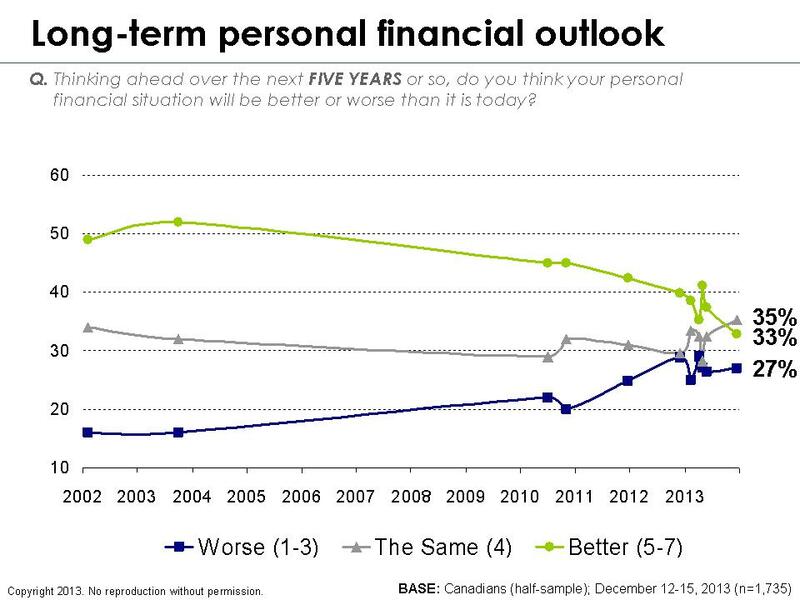 Indeed, the percentage of Canadians who think they will be better off in five years’ time has fallen to an all-time low of 33 per cent. 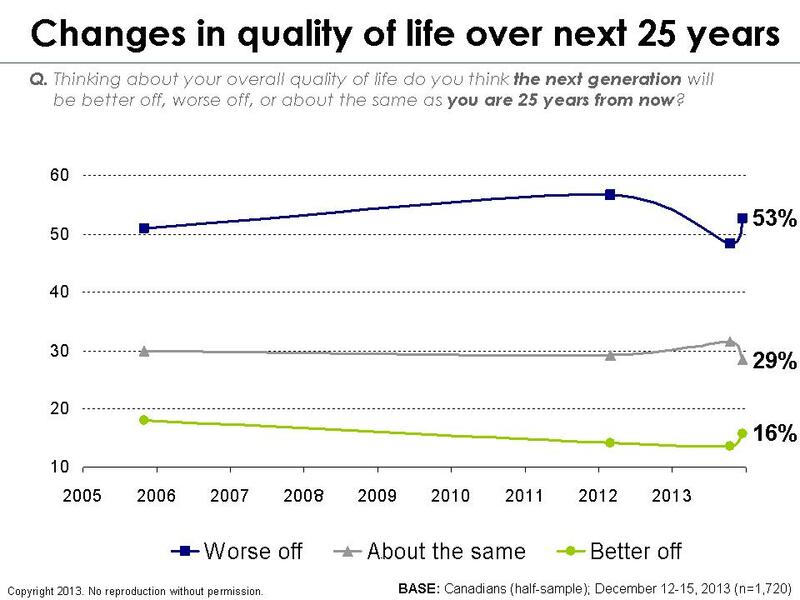 Furthermore, just one in three Canadians think they are better off than their parents, while a meagre 16 per cent think their children will inherit a better world than the one we live in now. The most telling indicator, however, is the apparent decline of the middle class. 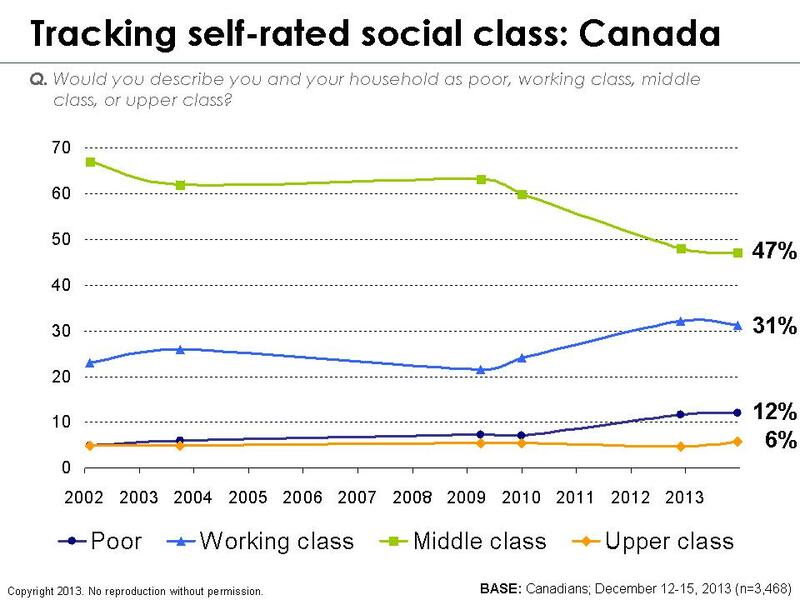 Ten years ago, two-thirds of Canadians called themselves middle class. Today, that figure has fallen to just 47 per cent. Meanwhile, the percentage of Canadians who see themselves as part of the poor and working classes has grown from 28 per cent to 43 per cent. So what do these numbers have to do with the political arena? Well, historically, politicians have targeted their campaigns at middle class voters, who have always made up the lion’s share of the electorate. Over the last ten years, however, this group has shrunk by nearly one-third while the pool of poor and working class voters has grown by more that 50 per cent. This growing force of worried and discouraged voters would be an attractive base for any political party, especially one that espouses a platform of hope and change. So far, it seems that Trudeau’s message of restoring middle class progress appears to be taking hold. Indeed, the party holds a small lead among the middle class, working class, and poor voters. 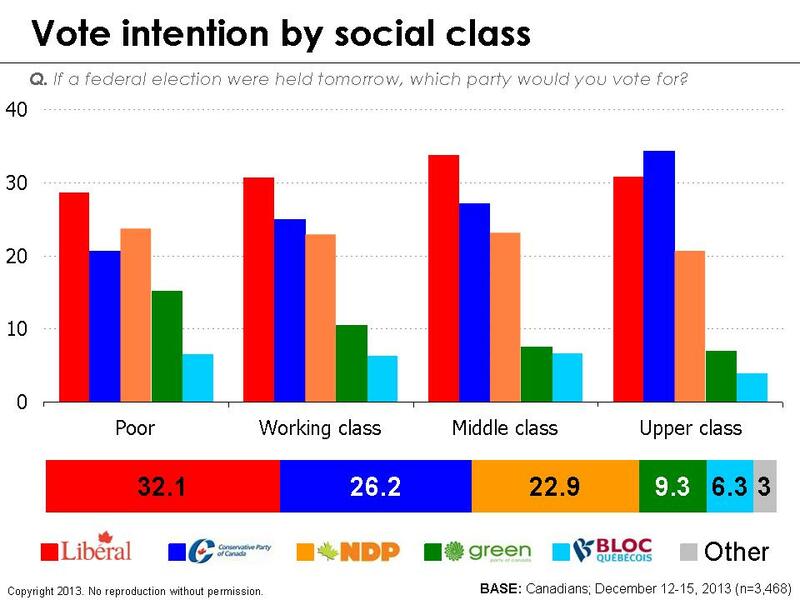 Conservative support, meanwhile, seems to rise progressively with social class – they lead (albeit insignificantly) with upper class Canadians, but they do quite badly with those who categorize themselves as poor. The NDP is equally competitive everywhere. It will be interesting to see over the coming year whether parties begin tailoring their campaign messages towards Canada’s growing working class or whether they continue to focus on an increasingly diminished base of what remains of Canada’s middle class. What this tells me is that those parties on the left need to look at coming together in order to get their agendas met. If, for example, the NDP and Green came together they would have a much more powerful environmental voice. 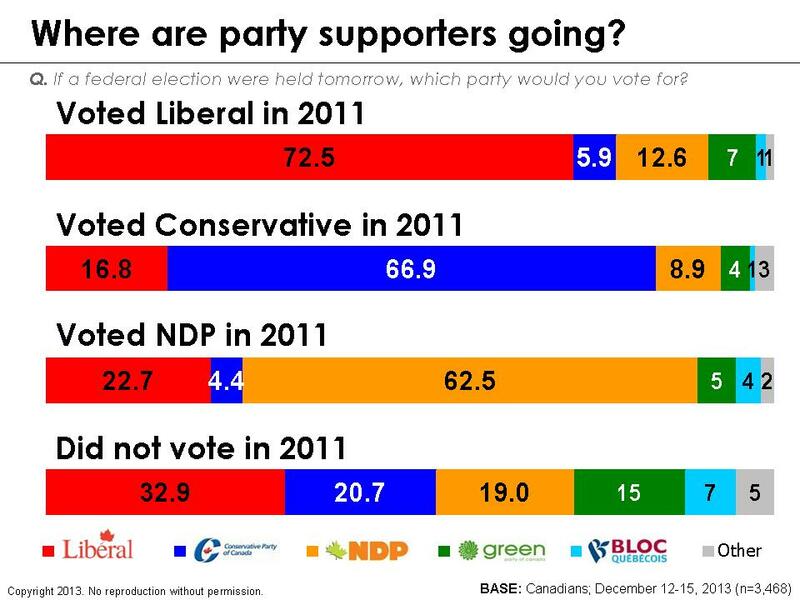 If the NDP and Liberals came together, the would form an overwhelming majority. I truly do not see a major difference between the three parties which justifies the three remaining separate.